So far in our series on Music and Coding we’ve covered the Why and the What. The Where and the When are obvious, which leaves us one unanswered question – How? The last 20 or so years have been a bit of a shaky transition for music, with (Deep breath…) the false start of MiniDisc, the disappearance of the Cassette, the arrival of the CD, the rise and fall of Napster, the birth of the MP3 player, the utterly forgotten format war between DVD-Audio and Super Audio CD, the advent of legal downloads, the resurgence of Vinyl, the début of legal streaming, and the (on-going) death of MP3 players at the hand of the Smartphone. The main players left standing, though, are downloads, streaming, the remnants of the CD market, and a small number of Vinyl enthusiasts. Since most CD purchasers will probably rip the music and use it in the same way as downloaded music, I won’t talk about it specifically. Before talking about the specifics of each, one thing to look out for with both streaming and downloads is that it can become very tempting to spend time putting together the perfect playlist for now as you’re working. This is a major distraction from work and can completely interrupt your flow! This problem is easily solved – you can make playlists in advance, find playlists made by other people (sometimes made specifically for programming! ), or just put whole albums on. Both downloads and streaming have their advantages, although I’d say that if you have a stable and fast internet connection, streaming is the way to go. With streaming there’s no cost to trying out new music, and if you’re coding in an office you don’t need to bring in a device with all of your music on it. It’s worth noting that many streaming services also offer downloads if you’re a subscriber, which can somewhat compensate for connection dropouts. There’s a few different streaming services around, but the ones I see mentioned most often are Spotify and Grooveshark. Spotify has long been the market leader, and recently lifted all its restrictions on unpaid streaming. It has a huge catalogue (4 million tracks of which have never been played!) with reliably good sound quality. Unfortunately, the free service has audio adverts, which will definitely break your flow – if you’re going to go with Spotify, prepare to either pay or be distracted. Grooveshark is all around a somewhat less polished service, but does have one key advantage. The free version uses only banner ads, leaving you free to work and listen without being distracted by audio ads. 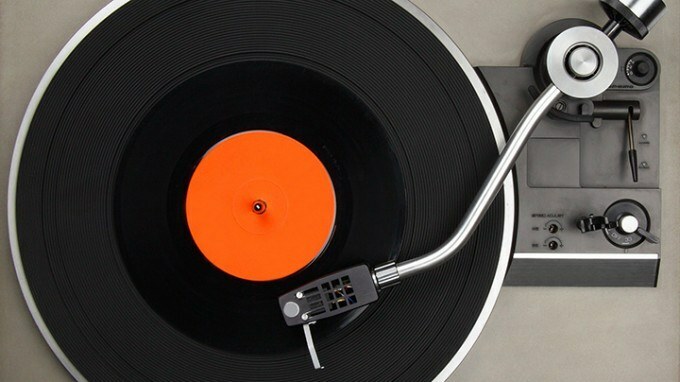 Vinyl has seen a bit of a resurgence in recent years among music lovers. Modern production techniques allow for very good sound quality, and the format lends itself to listening to music album at a time in the way originally intended by the artist. However, the reason I’m bringing it up here an odd coincidence. Pomodoro – as well as being the Italian for tomato, is a productivity technique used by many software developers. The general formula is to work on a task for around 25 minutes, take a short break, and then repeat, taking longer breaks after every 4 cycles. As you may have guessed by now, each side of a standard 12″ record runs from about 22-26 minutes. Once the side is over, stand up, grab a drink, flip the record, and you’re ready to get back to work. Alternatively, if (as is very likely) you don’t have access to a record player while you work, why not try putting together a number of ~25 minute playlists? As with everything else about music and coding, the best thing to do is try a few things out and find out what works for you. I think it’s clear, though, that how you listen to music is just as important as what you’re listening to. So go forth! Experiment! And let us know what you find.